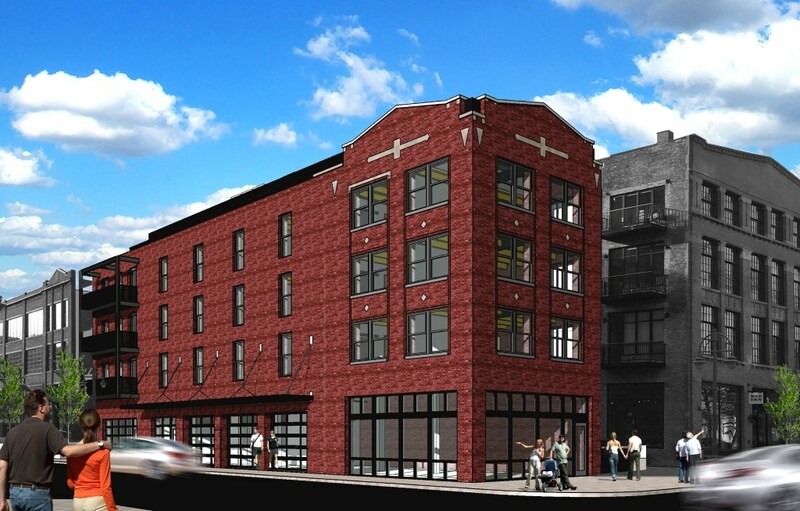 Rendering of 203 N. Broadway. Rendering by Engberg Anderson Architects. 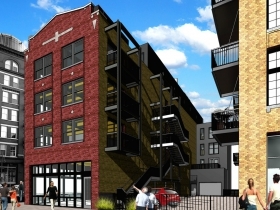 The Historic Third Ward Architectural Review Board gave its approval to the revitalization of a 1925 Commission Row warehouse building originally constructed for the American Wholesale Grocery Co. at 203 N. Broadway. The conversion of the 14,400-square-foot, four-story structure into seven apartments and street-level commercial space had been approved by the board at a December 2016 meeting. But since more than a year had elapsed, with no construction begun, it was necessary for the approval to be reconsidered. The board gave its unanimous assent after a brief presentation by the architect, Eric Ponto of Engberg Anderson Architects. The building sits at the northwest corner of N. Broadway and E. Chicago St., and is familiar to many Milwaukeeans as the former home of Paintball Dave’s. The structure is one of the few Third Ward buildings constructed with its ground floor at street level, rather than “dock high.” Those buildings, built to accommodate shipping of products directly into trucks, have first floors about four feet above grade, accessed by stairs. Renovation of these buildings has generally required the construction of an access ramp, often built in the public right of way. A more typical example of a classic Third Ward dock high warehouse is the Martin Building, a 28,000-square-foot, Eschweiler-designed structure built in 1904 at 211-215 N. Broadway for the American Knitting Co. That building is immediately north of the 203 N. Broadway building, with a small parking lot in between, which will serve the future tenants of 203. The Martin Building was converted into 15 apartments and two retail spaces designed by Ponto. The building includes a new access ramp in the front. The Martin building has been owned by Margaret Martin since 2009. She also owns the former Paintball Dave’s building, which she bought in May, 2016 for $1,500,000. The work on it will be done by Kelly Construction and Design. The firm has completed other projects in the Third Ward and environs, including work on the Wicked Hop, the Phoenix Building, the P. H. Dye House, Bavette Boucherie and the National Avenue Lofts. Construction is expected to begin in May. Site work has begun for the new 50,000-square-foot facility for the Milwaukee Ballet to be built at 132 N. Jackson St. The first step for the former railroad yard is to prepare the site, which is substantially rubble and fill. One important measure before construction is to ensure that the soil is sufficiently compacted to bear the weight of the new building, which will include a school, rehearsal, performance and administrative spaces. To accomplish that end, large piles of fill have been trucked to the site. Their sheer weight has been sufficient to lower the site by one-and-a-half inches over the course of a month. 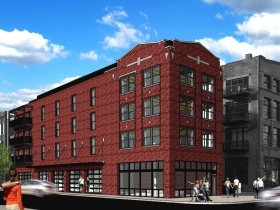 For more on the project, see Plenty of Horne: Third Ward Building Okayed. The interesting new group, ZipMke, whose motto is “28 Zip Codes, 1 City”, held an opening celebration for an exhibition of 300 recent photographs taken in every zip code in the city of Milwaukee on March 2nd at Coffee Makes You Black, 2803 N. Teutonia. Organizer Dominic Inouye greeted the attendees at the event, which featured the photographs of volunteers and the music of AhVant Soul. The exhibition will remain on display until March 18th. ZipMKE founder and Director Inouye, a former teacher, has engaged the services of dozens of local photographers in his community wide project. 1530 N. Cass St. Photo by Michael Horne. 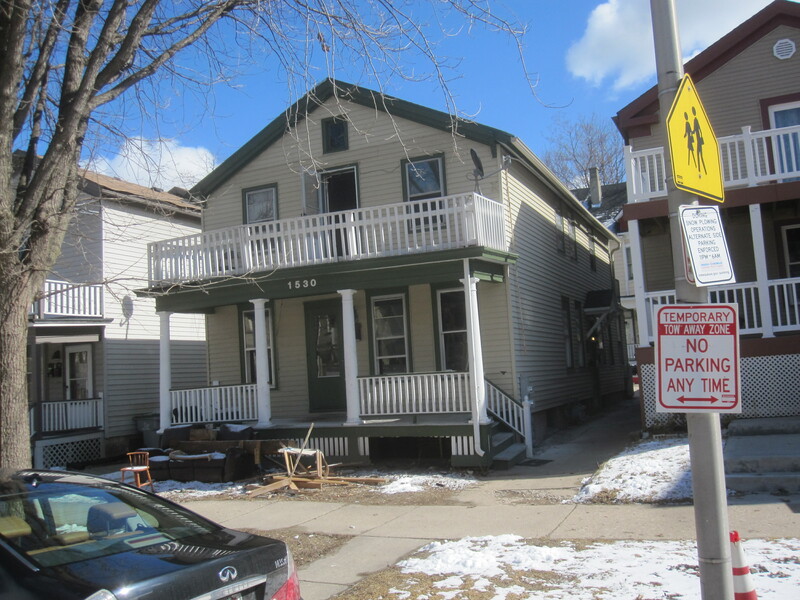 A gut-rehab is underway at two duplexes at 1530 N. Cass St. The front unit was built in 1870, while somehow a larger and more substantial building from 1908 was slipped into its back yard, apparently in one piece. The buildings have the rather lofty name of “Cass Street Villas.” Among those displaced for the remodelling is John Torres, the owner of WJTI [97.9FM], the Spanish language station known as “La Caliente.” Torres, a neighborhood native and graduate of the former St. Rita’s Elementary School, lived in the upper apartment for the last 38 years. From 1990-1997, I was his neighbor below. 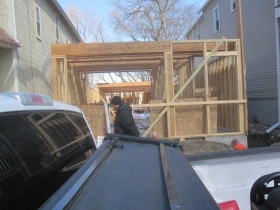 Torres has temporarily relocated to a new apartment building in the area while he contemplates construction of a new home on a family-owned vacant lot on E. Pearson St.
And work continues on two riverfront homes on the 1100 block of E. Kane Place. 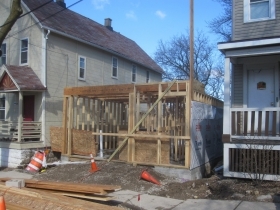 Both occupy former vacant lots, and are taking shape rapidly, with the westernmost home being fully under roof, while its neighbor has seen its studs rise nearly to the second floor. Across the street, an old cottage has been razed for future development, and its lot has been cleared and filled with compressed gravel for future construction. For now it offers a rare view of the Pulaski St. playground from E. Kane Pl. Work is also underway at the Nomad World Pub where a beer garden and ancillary structures are being built at the site of a razed home to the south of the popular Brady Street bar. Also on E. Brady St., a second floor extension is underway at Jo-Cat’s tavern. Not far away Jeno Cataldo‘s five-story apartment building is out of the ground at 1632-48 N. Franklin Pl., the site of a former Boys Club and later a church. New storefront windows, the first in decades, have appeared at the old Glorioso’s grocery building as part of the redevelopment of that historic space into a kitchen, catering office, demonstration and gathering facility. Owner Mike Glorioso says he is not out to set any records for speedy completion of the project. For one thing, the program is complicated, and includes the historically appropriate restoration of the fenestration of the building, which requires skilled labor. Furthermore, Glorioso says “every contractor in town has all the work they can handle right now.” His crews, he says, spend some time on his building, but then may spend several days on easy bread-and-butter projects like drywall installation in new construction before they return to pick up where they left off. That’s fine with him, he says, and allows him to refrain from hiring inexperienced crews so that he can get the job done right. 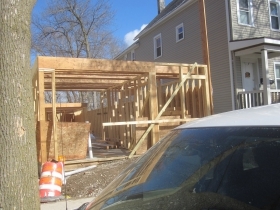 House Confidential honoree Joseph Pabst is in construction mode, with a gut-rehab underway in his new Regency House condominium. He said that asbestos was used in his 1968 apartment, leading to this drastic measure. Once the new apartment is completed, Pabst will move from his E. Newberry Ave. mansion to the more manageable downtown space, where he can leave his Bentley in the garage and simply walk to the St. Paul Fish Market and other favorite spots.